Home » The Good Systems Blog » Salesforce » What will it cost to transition to Salesforce Lightning Experience? What will it cost to transition to Salesforce Lightning Experience? In terms of additional licence fees, there is no cost to move from Salesforce Classic to Salesforce Lightning Experience. You are simply going to be viewing your Salesforce instance via a brand new, very much improved UI and it’s all covered within the cost of your existing payment to Salesforce. This is the case whether you have 5 users or 5,000. However, moving over to LEX could carry some associated costs related to the level of customised components within your setup. So, what should you therefore base your calculations on for a realistic LEX transition budget? Ok, so more complexity = more time = more cost. But how do you actually measure the level of complexity in your org and get an idea on what that will stack up in terms of cost, before you hit GO on the project? Your first port of call will be your Lightning Readiness Report. 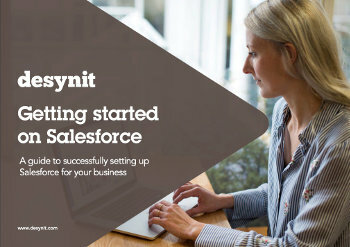 You can run this yourself via the setup menu in Salesforce – just take a look at the instructions here – it’s straightforward and you’ll have your report in minutes. From this report, you’ll get an indication of the number of days effort that your transition will represent. A word of warning however, our experience is that this estimation can be a little optimistic. The report will also highlight where you have complex customisation that cannot be migrated at the click of a button.. and this is where some uncertainty can creep in. With this in mind, here’s is a guide to the kind of timescales you will be looking at for your migration, in relation to this complexity in your Salesforce Classic setup. 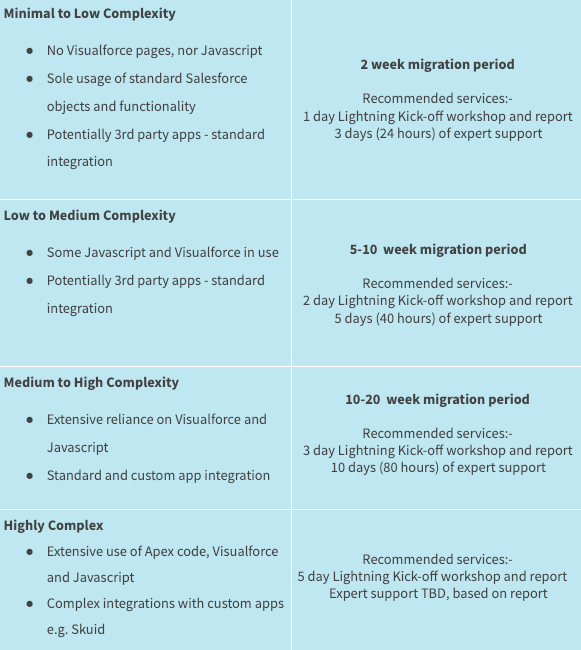 Within these timeframes there are going to elements of the Salesforce Lightning migration that you will be able to carry out in-house, without any requirements for external expertise. Lightning Kick off Workshop and Report – A fixed cost report based on between 1-5 days input from Desynit, spent on investigation and then documentation of your existing set up and considerations for migration. This is a chance to really analyse your existing set up and an opportunity to make Salesforce the best business platform it can be. Lightning Support Bank – Pre-purchase a number of days in a one-off support agreement. These days can then be drawn down in hourly increments to support your organisation across a number of Lightning Transition services. End-to-End transition – We carry out the whole migration e.g. assess, plan, build, test, deploy and train your users. You will receive a fixed cost in advance, based on our assessment of the complexity of your Salesforce setup. If you’d like to get more details on these packages, including our day rate for these services, then please fill out the form below to receive an email with full details. Alternatively, please do not hesitate to call on 0117 373 6880 and we can talk through the options over the phone.